The Directors of the Seattle Go Center have selected Mike Malveaux to be the Program Manager for the center. This is a new part-time position with responsibility for classes, workshops, visiting pros, outreach and school programs. Malveaux will also be updating the website, the mailing list, and the center’s social media. Brian Allen, the current General Manager, will be continuing at the Go Center as Operations Manager, with responsibility for the building, bookkeeping, and tax reports. The formal name of the Seattle Go Center is the Nihon Ki-in Go Institute of the West. The Hiring Committee of the Seattle Go Center interviewed three candidates for the Program Manager position, and all three were well qualified to do the job. However, when it came to teaching beginners, teaching in the schools, and organizing go events, Malveaux’s experience was particularly impressive. Malveaux ran go clubs in two schools in Tacoma around 2000 – 2006, and he was a frequent volunteer at Seattle Go Center events up to 2010. He has run or helped run about 25 tournaments, and has been a mainstay of the Tacoma Go Club, and now the South Sound Go Club. He did graphics for the 2005 Go Congress, and for several Summer Go Camps. In 2011, he started teaching snowboarding at Snoqualmie Pass to children and adults, and from 2013 – 2017, he was a paraeducator in public elementary schools, helping students with behavioral challenges. Mike Malveaux will continue to live in Tacoma, and he plans to keep up with the South Sound Go Club. He hopes to commute to Seattle by bus, and to get some reading done on the way. 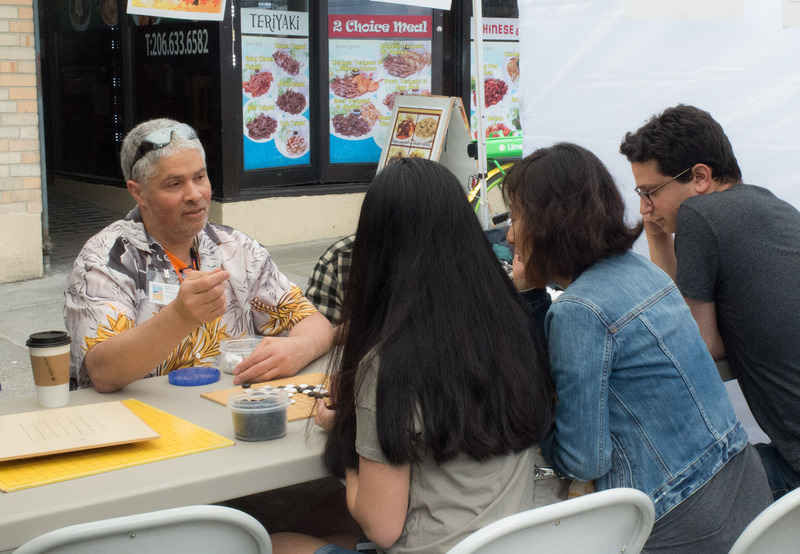 He will be at the Go Center most Tuesdays, effective May 29. photo: Mike Malveaux teaching at the 2018 U District Street Fair. photo/report by Brian Allen.